Matt Meyers (6'8''-F) scored 16 of his season-high 19 points in the first half, sparking a 20-6 run that helped the College of Idaho grab a lead they would not surrender, as the Coyotes won their fourth Cascade Conference Championships, presented by U.S. Bank, crown in six years, rolling past Southern Oregon, 70-55, inside the J.A. Albertson Activities Center. The No. 7 ranked Yotes (28-5) avenged a late season road loss to the Raiders - holding Southern to their lowest scoring total of the season - to claim the CCC's second automatic berth to the NAIA Division II National Championships. 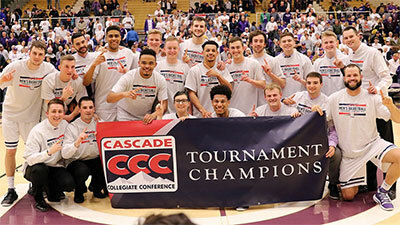 It marks the third-straight trip to Nationals for C of I, their fifth appearance in the last six seasons and their 22nd all-time NAIA tourney berth - with the Yotes finishing the season 16-1 at home. Trailing 19-13 midway through the first half, C of I made an effort to work the ball into the paint. Keun Palu-Thompson (6'2''-G) hit 3-of-4 free throws drawing fouls on post moves, with Meyers converting on the block and splashing a triple to tie the score at 21-21. Jake Bruner added a 3-pointer to give the hosts a 24-23 lead, with Connor Desaulniers (6'8''-F-97) converting back-to-back inside buckets and Gibson Berryhill canned a trey - part of a 7-0 run that gave C of I a 33-25 edge. SOU (21-11) cut the margin to 53-46 with nine minutes left after Aaron Borich (6'1''-PG) drained a 3-pointer and added a runner in the lane, only to have the Yotes hold the Raiders to one made field goal over the next six minutes. Desaulniers converted three inside baskets and C of I made 6-of-6 free throws in the 12-2 run that sealed the victory. Meyers finished 8-of-10 from the floor and made all three of his 3-point field goals, adding seven rebounds, while Desaulniers was 6-of-6 from the field, scoring 12 points with seven boards. Nate Bruneel (6'6''-G) added nine of his 11 points in the second half, with Talon Pinckney (5'10''-PG) scoring 10 points. C of I rebounded from a slow start offensively to make 62-percent of their second half field goals, ending the night 25-of-51 from the floor (49-percent), had a 35-29 edge on the glass and committed just eight turnovers. Tate Hoffman (6'7''-F) scored 15 points off the bench for the Raiders, with Borich adding 11. Tristen Holmes (6'2''-G), in his final game for SOU, had eight points, five rebounds and eight assists. Southern ended the night just 6-of-28 from 3-point range. Defensive Player of the Year: Talon Pinckney (5'10''-PG) of Idaho Coll. G: Keun Palu-Thompson (6'2''-G) of Idaho Coll. PG: Talon Pinckney (5'10''-PG) of Idaho Coll. Gibson Berryhill (6'0''-PG) of Idaho Coll. Nate Bruneel (6'6''-G) of Idaho Coll. Ryan Quigley (6'6''-F) of Evergreen St.